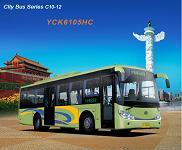 YCK6105HC Series city bus perfectly combines European elegance and Oriental classicality with the model bearing time flavor. It is specially designed with simple, bright and elegant streamline. The front walling is smooth and vigorous, which assures an open visual field. The enlarged side windows enables you to enjoy the best sightseeing effects and electrical defrosting system enhances the safety and the aesthetics and makes it convenient for passengers to enjoy a city's scene. This elegant European style even makes the city more colorful. Chinese engine:YU Chai engine.It is cheap and its quality is super.Other engine:Commins,Man and so on. We have many different types of seats for you to choose.